Last night, the TRIBE decided to eat at the Railway Asian (Filipino) Take Away in Zillmere. As we live on the other side of Brisbane River, we called up ahead of time…first to find out if there’s any seats available as it is a small shop and because we’ve been there a couple of times we ordered our dishes ahead of time, so we don’t have to wait that long. Sadly, Brisbane only have a handful of Filipino Eating Places and most of them disappears over time. The TRIBE haven’t yet tried the Gold Coast ones, but hopefully soon. 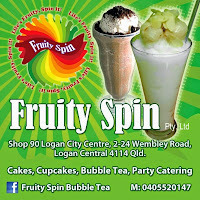 We heard about this Zillmere shop early last year and excitedly tried it out. On our first visit, we were not disappointed….the fried tilapia with fried slices of Lebanese eggplant, accompanied by bagoong was awesome, the Sisig was crunchy and bursting with zing from the chopped red onions and their Bihon Guisado was very tasty. The TRIBE tends to stick to dishes we particular like and myself to lazy to make everyday. The dishes we have tried are good but not “fall in your seat”. Good as in flavourful, edible and not too far away from the original versions. I have eaten in some of the old Filipino Eateries here in Brisbane (most of them already closed) and I tell you, most of them kind of lost the plot when it comes to cooking, they just go downhill, why is that? TRIBE arrived around 6:45 pm and we sat outside the shop, we prefer outside as inside, the shop is a bit too cramp for us. The three disadvantages of eating outside are…the pavement is kind of sloping, during winter you get slapped by the cold wind and the train passengers gawking at your food as they make their way home. Oh, I forgot it is next to the Zillmere Train Station…..hehehehehe! Big bonus for those who doesn’t have a car, you only walk for a minute and you are there. We ordered Sisig, Bihon Guisado, Crispy Pata, 1 1/2 pot of steam rice and 2 cans of Coke which comes in total of roughly around AUD$57.00 (not bad! for once in awhile “Filipino eating out homesickness”). What I like about the dishes we always ordered is that the quantity of the ingredients are not scrimped. The only thing that was off putting was Miss Piggy forgot to shave/waxed in some sections but for a Crispy Pata dish, Railway Asian Take Away shines as the skin was really crispy with “melt in your mouth” fat attached to it. The soy dipping sauce was missing something, it didn’t have that punch….might be crushed garlic , maybe they omitted it to cater for Australian taste? Overall, it was a pleasant night, the TRIBE was “busog” (full) and even have 2 small take away containers with our leftover sisig and bihon guisado to take home. NOTE: Cusinera got the leaflet~27 March 2010.
hairy pata... HAHAHAHAHAHA! Good one Cusinera! i must admit i have never tried anything filopino as yet. i have to try and cook filipino one day cause the food looks pretty good! Oh my - that crispy pata looks to die for. Brings me back home. I grew up in Australia but with Filipino heritage and I must say every single food on this site is to die for. yum yum. Every time I look at every food item I want to go back to the Philippines even more! @Jared, thankyou for visiting=)Zillmere is next to Chermside.....just google it, it will show you the map! Cusinera Thanks so much, I've been living in Brissy for 6 years now the only kainan I know is BestFriends in Fortitude Valley! I have to try this!!! thank you so much cusinera for reviewing this resto! i am a filo and we live 4 hours away from brisbane and last month when we did go to brissy for an appointment, i made a note to try this resto! the crispy pata looked too good to miss. anyway, we (filipino food lovers) ordered take away and weren't disappointed at all! the crispy pata stayed crispy even after 45min in the take away bag. their pansit didn't look too appealing but boy! it tasted liked it came from a local pansiteria in the Phils. and we also liked their pinoy beef steak, tender and flavorsome though a bit short on the sauce. will definitely go back next time we are in brissy! @Anonymous~ You are so welcome:) I'm glad that this post review of mine was useful and am always happy reading comments from people who read Busog! Sarap! posts, hope you visit my blog often! I just stumbled upon your blog when I visited the ourbrisbane website and I saw your post about Inala and their Asian groceries. I am so excited to have found your blog as we have just recently moved up to the Northern Suburbs in Brisbane from the inner suburbs of Sydney. Finding Asian groceries here let alone Filipino ingredients has been somewhat of a challenge and if it is found prices are double what they are in Sydney! You have done a great job with this site and I can guarantee I will be a regular reader...One thing I have had the hardest time finding here though is Tilapia. Do you have any idea where I can buy this? I have only been able to find Bangus at the Fish Market in Ianala. Any help would be much appreciated! I know what you mean about the prices in Filipino ingredients. One of the main reason why it's so expensive is that they have to transport the goods from NSW to Brisbane and that is the additional cost (the cargo fee)...wish there's more direct Filipino importers here. You can find some Filipino products in Yuens, Sunnybank and they're almost half price cheaper then Filo shops. In regards to Tilapia, I just went to Inala and the other Fish shop further down away from the Fish Market sell frozen ones but the ones I saw was salted...not sure if they have just plain frozen variety.